I hardly believe it myself. AND that’s not even the unbelievable part. and well…you get the picture. On the left is a scan of my belly at the end of January. Everything above the red arrow is the layer of fat on my belly. 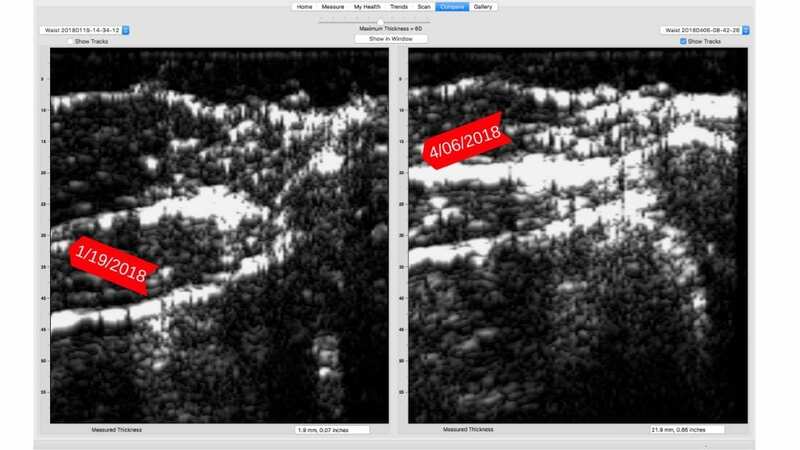 On the right is a scan from the same spot just a few months later. You can see that the layer of fat has shrunk significantly. The results are great, but my favorite part of this experience has been not feeling like I’m on a “diet”. Now I promised to tell you how I lost the fat, so let’s get into it. If you love doing something, do you have to force yourself to do it? Of course you don’t. You probably have to force yourself to stop doing it before you go blind am I right? I’m talking about binge watching Game of Thrones, what were you thinking? Back to my point, doesn’t it stand to reason that if you love your program you’ll come back to it again and again. The Rule #1 for getting lean and strong for life is to love your program. Rule #1 for getting lean and strong for life is to LOVE YOUR PROGRAM. Find a workout that you can love and you will stick to it, and then the results come like magic. The only way to get lean and strong for life is to build a fitness habit. But to make fitness a part of your life, you’re going to need a couple of pressure relief valves. The pressure of eating on-plan all of the time is too much for anyone. Everybody needs a few meals a week where you can eat whatever you want and as much of it as you want. That’s how I lost weight eating hamburgers and fries. Twice a week I treat myself and that makes it a lot easier to stay on plan the rest of the week. Rule #2 is Free Meals are not Cheats. They’re a part of your program. Have 2 a week. Do These 2 Things or Your Diet Will Fail from The Fix Gym on Vimeo. If your diet is not delicious, satisfying, it will fail. Not to mention that eating food that isn’t delicious and satisfying is torture. Don’t torture yourself, it doesn’t work plus you don’t have to. Working on your body should be a celebration, not torture. Plus, life is just too short not to enjoy what you eat. Rule number 3 is your diet has to be delicious and satisfying. …it also doesn’t hurt if it’s fast and or easy. I built my plan on the foundation of those 3 rules and I’m blown away by the results. Of course, I’m only about halfway to my goal, but I’m not sweating time right now. I’m just loving my program and I hope you that you are too.